BALTIMORE (AP) Nelson Cruz wasn’t available, so Kyle Seager assumed the role of big bopper for the Seattle Mariners. And what a job he did. 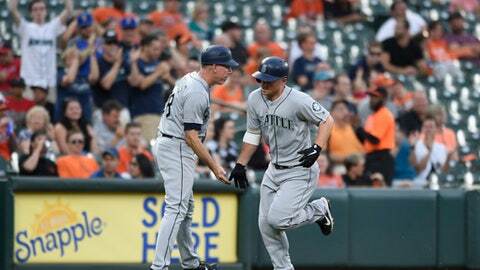 Seager homered and hit a pivotal two-run single in the eighth inning to back a fine pitching performance by James Paxton and help Seattle beat the Baltimore Orioles 3-2 Tuesday night. Cruz, who leads the team with 20 home runs, was a late scratch with lower back tightness. Seager took over at cleanup and accounted for all the Mariners runs. Though Seager came through in a pinch, he knows his place in the lineup isn’t cleanup. Paxton (7-2) struck out 10 over seven innings, allowing two runs and six hits. It was the sixth time this season he’s reached double figures in strikeouts. The Mariners came to town with six losses in seven games, and now they’ve won two in a row to open a four-game series against the team with the worst record in the majors. Alex Colome worked the eighth and Edwin Diaz got three outs for his big league-best 29th save. Seattle trailed 2-1 before rallying against the weary Baltimore bullpen. Dee Gordon led off the eighth with a double and Jean Segura got his third hit of the game on a bunt down the third-base line. Orioles reliever Darren O’Day (0-2) hurt himself trying to field the ball and was replaced by Tanner Scott, who walked Mitch Haniger before Seager hit a liner to center. O’Day’s injury was a troublesome hamstring that has been bothering him for weeks and will likely land him on the disabled list. In the fourth inning, Seager hit his 14th home run to offset a second-inning solo shot by Danny Valencia. It was still 1-1 in the sixth when Baltimore used three straight singles to load the bases for Manny Machado with no outs. The three-time All-Star bounced into a 4-6-3 double-play, breaking into a trot long before he reached first base. Kevin Gausman gave up one run and five hits in six innings. He left with a 2-1 lead, but the bullpen gave it away, leaving Gausman winless in eight starts since May 11. Servais may soon be sporting a different look, thanks to a bet he made with Diaz earlier this season. Servais said he would get waves identical to the ones Diaz has shaved into the side of his head if the closer notched 50 saves this season. ”I’m looking forward to the day; others in my family are more concerned,” Servais said of the potential haircut. Mariners: C Mike Zunino was back in the starting lineup after missing Monday’s game with a sore thumb. Orioles: Showalter said after the game that OF Craig Gentry sustained a rib injury after being hit by a pitch and will be placed on the disabled list. … RHP Dylan Bundy was placed on the DL with a sprained left ankle. He’s expected to be back on July 6. … RHP Chris Tillman (back) will take his rehabilitation assignment to Triple-A Norfolk after allowing two runs in 3 1/3 innings for Class A Delmarva on Monday. Mariners: LHP Wade LeBlanc (3-0, 3.26 ERA) starts on Wednesday night. He is 1-2 with a 4.50 ERA in four lifetime appearances against Baltimore. Orioles: Alex Cobb (2-9, 6.56) has gone seven innings in each of his last two starts after yielding nine runs and 11 hits in 3 2/3 innings against Toronto on June 10.